This project is another example of how to maximize small spaces. 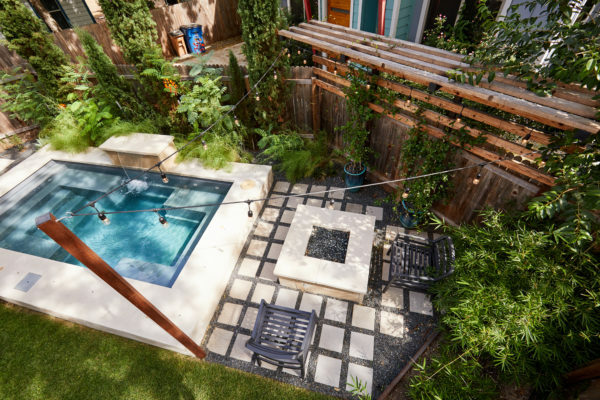 This customer’s small Brentwood yard was centered around their new plunge pool. However, the existing pavers and layout left much to be desired. We reworked the pavers to create usable spaces and clean lines, and a vines and lighting work with the custom pergola to increase the privacy and add a soft vertical element to encourage the intimate feel of the space. Two other structures block the pool equipment and AC compressor from sight. This reduces the visual weight of these areas and allows the eye to focus on the crown jewel of the space… the pool. This project won the bronze awards for Landscape Design in the 2017-2018 Texas Excellence In Landscaping Awards. This duplex has a very modern aesthetic with focuses on clean lines and metal accents. However, the front courtyard was undeveloped and uninviting. We worked with the client to tie the courtyard and the property together by adding clean, monochromatic details with a heavy focus on texture. The main goal of this project was to add a low-maintenance outdoor living space that was an extension of the home. The small space and harsh sun exposure limited the plant pallet, but we were able to use lush plant material to maximize the space. A monochromatic pallet makes for a perfect backdrop for focal points and key pieces. The circular fire-pit was used to break up the 90 degree angles of the space, and also played off the round pottery. Small yards are always a welcomed challenge! 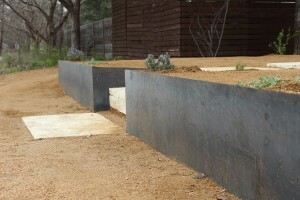 The exposed utilities, and awkward slope presented even more landscape challenges to deal with. 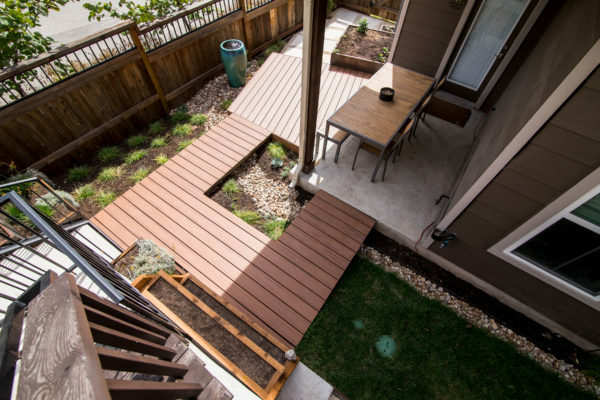 Despite these obstacles, we were able to create an accessible and inviting space by using three different pathways as a focal feature of the yard, leading into the open and borderless design. To makes the space feel larger, a custom designed steel retaining wall was installed and the yard was regraded to achieve this effect. The sawn limestone slab stairs wedged between sheets of steel offer a contrast that is Modern-Rustic; a landscape style emerging here in Austin. A steel trellis to hide a collection of utilities is featured opposite a steel box planter, which add to the style as well as complimenting the asymmetry of the home very nicely. 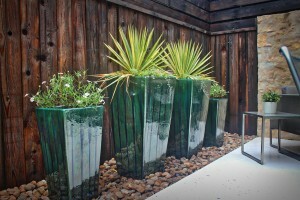 We used a simple, airy, and of course, drought-tolerant plant palette. Evergreen trailing rosemary to spill over the retaining wall, a carpet of thymes to creep in amongst the limestone slab pavers, and some well chosen tropical looking plants will soften the entire feel as they grow. It’s such a unique landscape! Can’t wait to see how it matures! As a transplant from the Big Apple, this customer was accustomed to small spaces. 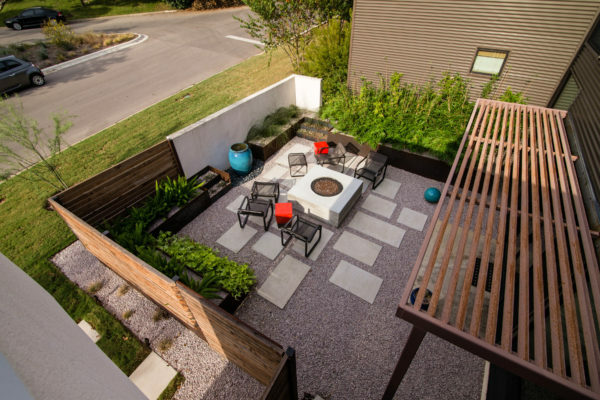 What might seem like a small Texas yard, was more than enough to create three separate outdoor living spaces for her new Austin life!